Drum Corps International, the leader in producing stadium events for the world's most elite and exclusive marching music ensembles for student musicians and performers, is pleased to announce two exciting new additions to the DCI family of competitive event brands. John DeNovi, Senior Director of Business Development for Drum Corps International, is enthusiastic about these creative new initiatives. 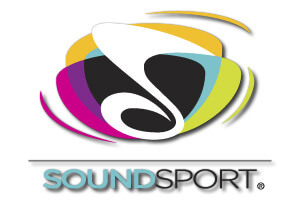 "We are very pleased to be unveiling DrumLine Battle and SoundSport® today, as DCI prepares for its 41st season and its annual summer tour across the United States. In harmony with the objectives of our business plan and our strategic vision for the future, we are focused on creating dynamic opportunities for vast new audiences to engage with our organization and the positive values it represents." • Virtual Competitions – ongoing online contests and tournaments, featuring performance videos submitted from teams competing to score points, prizes and bragging rights against other groups from every continent—all in an environment where everyone can be a judge! • Live Competitive Events – held throughout the year in a wide variety of exciting settings and environments, featuring a new level of entertainment-focused competition on high-energy, up-close performance stages smaller than the traditional American football stadium. "With a rapidly growing, passionate, informed, talented and engaged fan base throughout the world, and strategic alliances already in place with marching music associations in China, Hong Kong, Japan, Indonesia, Korea and Thailand, new opportunities are developing at a breathtaking pace," said DeNovi. "Combined with the existing awareness and presence of the drum corps activity throughout Europe, Asia, South Africa, South America and beyond, our goal is to create another avenue to unite the world through music and performance, to promote teamwork and the pursuit of excellence, and to have a heck of a lot of fun in the process." Drum Corps International Executive Director and CEO Dan Acheson echoes DeNovi's enthusiasm. "We want to expose the largest possible global audience to the greatest attributes of what we have come to know as the DCI experience. The levels of excellence achieved by our touring groups are truly remarkable, however the financial and practical costs, related learning curve and inherent startup risks associated with our existing business model make it difficult for us to bring new ensembles into our world as participants," said Acheson. "Through the creation of these two extremely exciting initiatives, we intend to vastly expand our footprint and aggressively pursue opportunities to engage more people in appealing new ways." 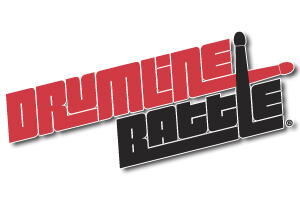 Acheson continued, "While serving the groups which comprise our collective fraternity will undoubtedly remain our primary day-to-day responsibility, the potential created by the addition of DrumLine Battle and SoundSport® to our portfolio is staggering. The possibilities for successfully extending our reach to introduce an enormous number of new people around the world to what we do are electrifying." DeNovi added, "These programs will enable us to maintain and protect the positioning of what we've come to know as the DCI drum corps brand as the ultimate destination in the marching arts, while providing a series of fresh, discrete, new opportunities for interaction. 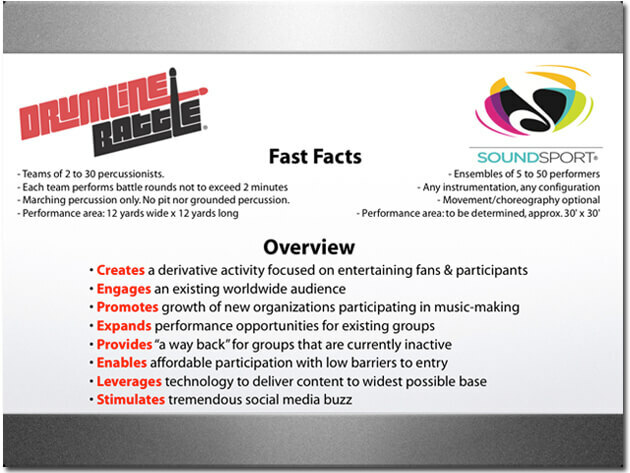 We'll be able to offer large-scale exposure in an entirely new context for groups ranging from pro sports drum lines to college pep bands; from groups usually restricted to recital halls and rehearsal rooms to community-based ensembles to things we haven't even considered nor imagined yet." Mark Arnold, Chairman of the Board of Directors of Drum Corps International and Executive Director of Blue Knights Drum and Bugle Corps said, "We also want to reach out to the students in high school band rooms throughout the United States who perhaps aren't already engaged with other activities such as indoor percussion, color guard, chorus or theater to provide them with an opportunity to create a new style of outstanding performance in an up-close, fun, high-energy atmosphere." Arnold continued, "These initiatives will also provide new opportunities to rekindle competitive flames for formerly competitive drum corps organizations from throughout the USA, Canada and beyond, as well as other types of performing groups who have become dormant. They could also be a startup boost to fledgling organizations working to become established in their neighborhoods, as well as a chance for community-based bands and instrumental performers from all walks of life to share the common bond which the performing arts provides. We're very excited about these opportunities and are looking forward to welcoming these groups as the newest additions to our extended family." DCI is systematically meeting with valued strategic partners to discuss opportunities to create an even greater impact and further broaden the scope of the programs. "The ideas presented through the creation of these two initiatives are some of the freshest and most exciting I've heard around the drum corps activity in nearly 50 years of involvement," said Gil Silva, President of Drum Corps Associates, the sanctioning body of the "All-Age" drum corps activity. "We look forward to learning more and discussing these opportunities with our members in the days ahead."